All Gladwyne homes currently listed for sale in Gladwyne as of 04/21/2019 are shown below. You can change the search criteria at any time by pressing the 'Change Search' button below. If you have any questions or you would like more information about any Gladwyne homes for sale or other Gladwyne real estate, please contact us and one of our knowledgeable Gladwyne REALTORS® would be pleased to assist you. "Westbourne Woods - A unique, custom build, combining everything on the must have list of the most discerning buyer: premier address; sold exterior construction, interior finishes evidencing the finest of craftsmanship; generous square footage; unique spaces for both living and playing and acres of expertly manicured lawn. This is the home which all the superlatives really do apply. Westbourne Woods is the product of a marriage between the Main Line's premier architect and most acclaimed high end builder. Just 14 years ago, F.L. Bissinger summoned one of his unique, Artisan Revival Style designs to E.B. Mahoney, whose name is synonymous with the highest in quality building standards. The resulting, expertly Colonial residence consists of three finished levels, positioned on 8 acres, with an additional adjoining lot of more than 6.5 acres available for purchase. Inside are 6-7 Bedrooms, 7 full baths and 4 half Baths, five fireplaces, an in-home theatre, wine cellar, indoor swimming pool, baseball batting cage, gym quarters and a 4 car Garage. Energy is partially supplied by solar panels. Twenty minutes from CC Philadelphia and a short drive from the links of the famed Philadelphia Country Club, drive through the gates of 1520 Monk Rd. Descend the driveway lined with stone walls which are finished with bricked lattice. Cross the cobblestones and enter the massive aged wood double door into a stone floored Foyer. Step down into the formal Living Room featuring floor to ceiling windows, exceptional quatrefoil plaster work ceiling and hand hewed plank hardwood floors. Pivoting between contemporary and traditional, this formal space is designed with multiple seating areas for small or intimate gatherings. Dramatic volume ceiling bar room with outside entrance is highlighted by an exposed stone wall with incorporated candle ledges for twilight entertaining. Steps away is a Library w/fireplace,Family Room w/fp, formal Dining room with hand painted ceiling. An expansive Kitch"
"Westbourne Woods - A unique, custom build, combining everything on the must have list of the most discerning buyer: premier address; solid stone exterior construction, interior finishes evidencing the finest of craftmanship, generous square footage, unique spaces for both living and playing and acres of expertly manicured lawn. This is the home which all the superlatives really do apply. Westbourne Woods is the product of a marriage between the Main Line's premier architect and most acclaimed high end builder. Just 14 years ago, F.L. Bissinger summoned one of his unique, Artisan Revival Style designs to E.B. Mahoney, whose name is synonymous with the highest in quality building standards. The resulting, expertly Colonial residence consists of three finished levels, positioned on 8 acres, with an additional adjoining lot of more than 6.5 acres available for purchase. Inside are 6-7 Bedrooms, 7 full baths and 4 half Baths, five fireplaces, an in-home theatre, wine cellar, indoor swimming pool, baseball batting cage, gym quarters and a 4 car Garage. Energy is partially supplied by solar panels. Twenty minutes from CC Philadelphia and a short drive from the links of the famed Philadelphia Country Club, drive through the gates of 1520 Monk Rd. Descend the driveway lined with stone walls which are finished with bricked lattice. Cross the cobblestones and enter the massive aged wood double door into a stone floored Foyer. Step down into the formal Living Room featuring floor to ceiling windows, exceptional quatrefoil plaster work ceiling and hand hewed plank hardwood floors. Pivoting between contemporary and traditional, this formal space is designed with multiple seating areas for small or intimate gatherings. Dramatic volume ceiling bar room with outside entrance is highlighted by an exposed stone wall with incorporated candle ledges for twilight entertaining. Steps away is a Library w/fireplace,Family Room w/fp, formal Dining room with hand painted ceili"
"Breathtaking custom crafted gated and fenced Gladwyne Estate offering a superior combination of exquisite architectural designs by Lyman Perry, stunning craftsmanship using only the finest materials by Woody Cullen including 6 oversized Garage bays with a finished one bedroom In-Law apartment above, fabulous interior designs throughout by Carl Steele, incredible landscaping by Chuck Hess with Armond infinity pool/ spa, timeless hardscaping enhancements by John Rossi and artistic fountains/ ponds by Pondworks . Turn your key and enter this 2.6 acre serene oasis, close to renowned schools, shopping, Center City Philadelphia, Philadelphia International Airport, Acela trails, 90 minutes from New York City and more. Features include beautifully understated millwork, moldings, rich paneling and casements, wide plank random width oak floors, 5 fireplaces, sun- filled windows and French doors capturing the endless views, gracious rooms with soaring ceiling heights and an open flow out to the surrounding terraces and grounds,7 spacious bedroom suites each with their own full bathroom, luxurious Master Suite with trayed ceiling,creamy marble bathroom and large, naturally lit His and Hers dressing rooms, expansive Lower Level with Entertaining Media room/ Bar walking out to the terraces and scenic surroundings. Absolute move in condition"
"Originally the estate home of E. Fenimore Johnson, this magnificent stone Manor home has undergone extensive renovations and updates by Waverly Construction and Thistlewood Properties. 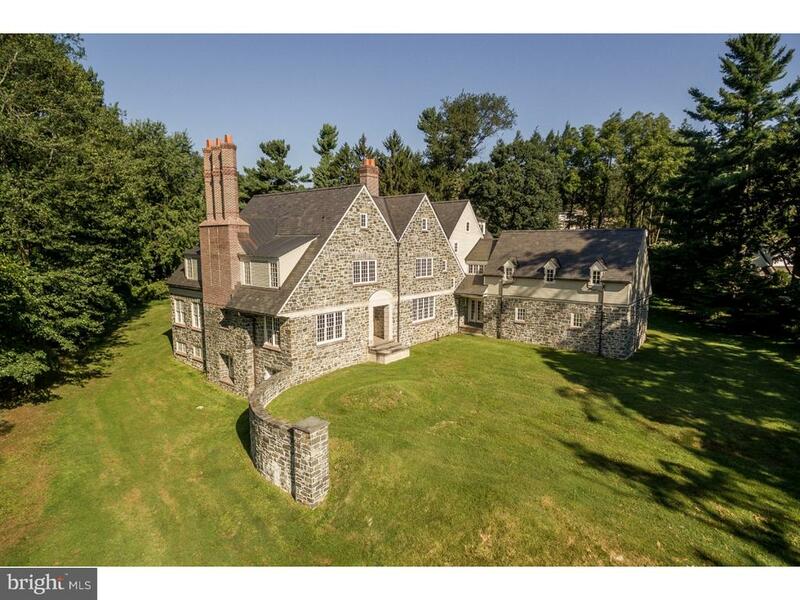 Positioned on almost six acres with additional surrounding conserved ground in the heart of Gladwyne, this stately home offers 6 Bedrooms, 6 Full and 2 Half Baths with pool and an adjacent independent guest house. The recently refreshed home is unique in its ability to offer grand as well as intimate spaces on its 4 finished levels. Exquisitely detailed, beautifully maintained and professionally appointed. 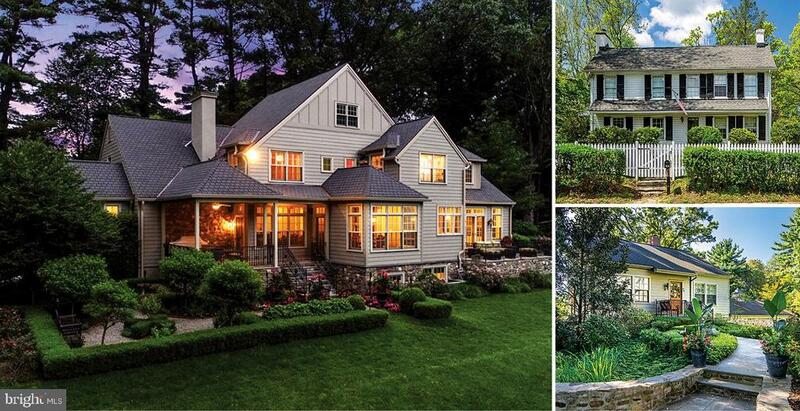 A one-of-a kind offering within the suburb of Gladwyne." 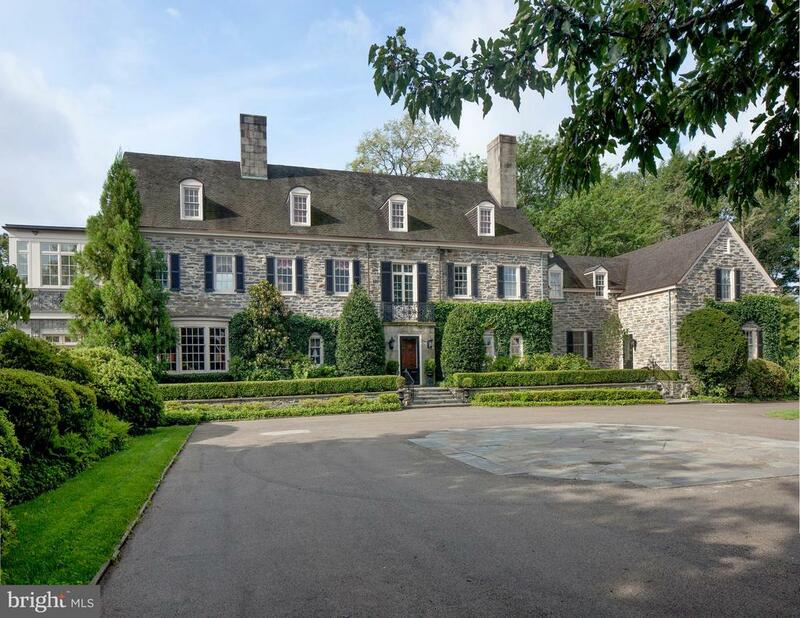 "The legendary Main Line estate, Rocky Crest, is a showcase of superior workmanship, stunning architectural details and picturesque views of the exquisite gardens originally designed by world-famous landscape architect Thomas Sears. Even more recently added amenities and improvements blend seamlessly. Built circa 1901, this breathtaking residence sits privately on over 15 acres - some of which are preserved in perpetuity - and include a 70x30 in-ground pool, pool house, tennis court, and a carriage house with two 1-bedroom apartments, a wine-tasting room and a 1,000-bottle wine cellar. A long and circular drive leads to the main entrance and the grand reception hall flooded with light and rich detail. The main house is designed into various wings, and many of the rooms have oversized fireplaces. Various bedrooms have individual bathrooms and provide suite-like privacy, as well as views of the expansive grounds. The East wing contains the incomparable Master Suite with two large sitting rooms, one with fireplace and balcony, three private baths, and grand, room-size walk-in closets. The custom kitchen features all high-end finishes and appliances such as Wolf and Sub-Zero, and extends into a separate butler's pantry. The main floor media/family room is simply nonpareil - from the warmth of the solid wood bookcases to the room's intimate feel. A sunroom, a library, and many other rooms all blend to create this outstanding example of historic architecture. There's even a Rathskeller with gaming room and massive fireplace. 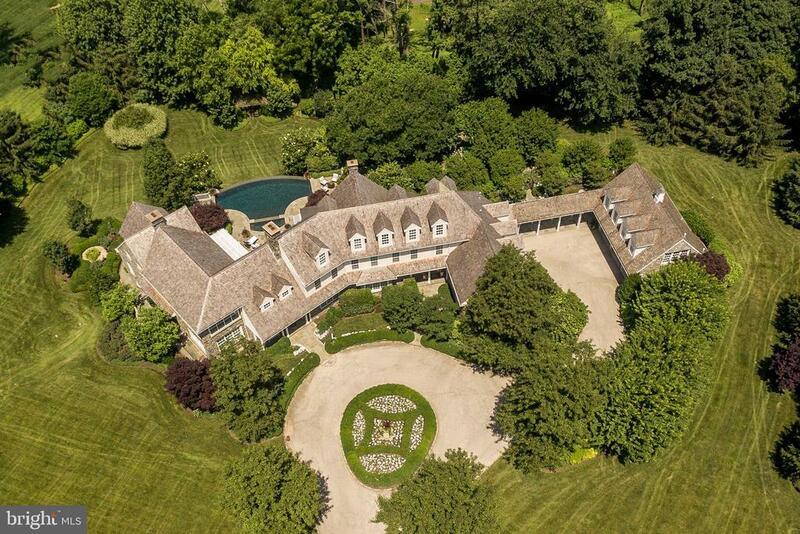 To find such an estate so exquisitely designed, so privately situated on the Main Line is almost unheard of. 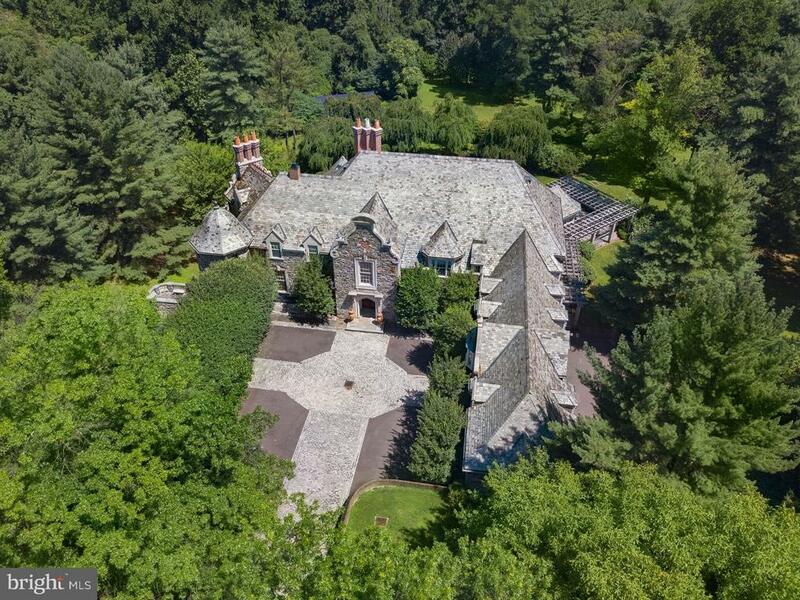 To be part of its future is incalculable. ."
"This one-of-a kind multi parcel estate (914 & 916 Black Rock Road) is situated in a secluded, private grove on 2+ acres of mature land within easy walking distance of the historic village of Gladwyne. The Estate includes the Main House & Barn at 916 Black Rock Road, & Guest Home (currently rented) at 914 Black Rock Road. The Main Home is 13 years new, with 5 bedrooms, 4 full & 1 half bathrooms. It's first floor master is surrounded by 2 private gardens, & features his-and-hers walk-in closets plus a spa-like bathroom w/ a wall of windows & private access to a secret garden. Random-width wood floors run throughout the first floor, which includes a formal living room w/ fireplace, a large dining room surrounded by windows & doors that open onto a flagstone patio overlooking the property, and a large family room with stone fireplace & vistas that bring the outside in. Its doors lead to multi-level flagstone patios for entertaining in manicured gardens. The kitchen boasts a large island w/ seating, plus solid wood cabinets in beautiful rich wood tones topped with black soapstone counter tops. Antiqued white wood cabinets set apart the fully-equipped butler's pantry, abundant w/ storage, a second dishwasher, & a wine refrigerator. Lower level features a bespoke 1,000+ bottle wine cellar, large game room/entertainment area, personal gym, full bathroom w/ steam shower, & extra pantry & storage areas (including cedar closet). The Barn renovation preserved its history by salvaging & maintaining the original floors, ceiling beams, & barn doors, & enhanced the building to include: 2 bedrooms, 2 full bathrooms, full kitchen, a living room w/ fireplace, large dining area, flagstone patio, 2-car attached garage, laundry, & a large meeting/party room w/ a kitchen staging area. The Guest Home is a charming, absolute head-turner, surrounded by a white picket fence. Built in 1700-1800's, it's original wood floors, slate floors, and divided glass windows have been lovingly maintained." "On one of the Main Line's most desirable streets, this magnificent estate sits on 1.86 flat, private acres. Every inch of this spectacular home has been built with the finest materials and craftsmanship; marble, reclaimed wood floors, spectacular limestone fireplaces, beautiful millwork and intricate crown molding. This grand 15,317 square foot masterpiece features 6 bedrooms, 8.2 bathrooms, incredible sprawling-grounds, indoor and outdoor pools, three level master suite, mahogany crafted bar room, gourmet kitchen, library, mirrored gym, indoor sprinkler system, elevator, and steam & sauna rooms. The impressive, two-story entrance hall with stone floors opens to a magnificent, double story formal living room with two story limestone fireplace and floor to ceiling windows, opulent dining room, sophisticated bar with fabric paneled covered walls, and a family room. The interior floor plan was designed for lavish entertaining. The eat-in, gourmet kitchen includes a large center island with breakfast bar, top of the line appliances, plenty of cabinet space and a butler's pantry. The three level master suite features dual bathrooms with his and her walk-in closets, a separate sitting area or office, gas fireplace and private balcony. The three level master suite is connected by an independent staircase that connects the bedroom, library and gym to a fabulous closet/dressing room. The fully finished, walk out lower level offers a recreational/screening room, a unique indoor pool with hand painted walls, a full kitchen, massage room, one full bathroom, one half bath, large laundry room and plenty of storage space. The gated property also features a circular drive and 4-car garage with direct access. This sought after location is minutes to 476, 76 and Center City all while in the award-winning Lower Merion School District." "Perfectly situated on a desirable tree-lined street, tucked behind gates in Gladwyne, lies this gorgeous 2.42-acre estate featuring a grand, 5 bedroom, 8 full bathroom, 2 powder room home with expansive sprawling grounds, numerous flagstone terraces and a spectacular pool. The elegant floor plan is ideal for a sophisticated yet relaxed lifestyle. The dramatic 2-story foyer flows to the formal living room with wood burning fireplace and wet bar, the stately dining room features magnificent woodwork with tray ceilings and an impressive, wood paneled library/office with wood burning fireplace. The gourmet kitchen features two large center islands, one with a built in breakfast area, top of the line appliances, spacious butler's pantry and separate breakfast room with gas fireplace. Off the kitchen is a large family room with tray ceilings, warm/inviting fireplace and access to the meticulously maintained backyard. The second floor features 3 spacious bedrooms all with private bathrooms and a spectacular master retreat that is much like its own residence with a private foyer, sitting room with fireplace and private bathroom, Juliet balcony, dual spa-like baths, his and her walk-in closets and a wet bar. A fabulous 3rd floor master bedroom closet, which can be access through the master bedroom, is a dream come true with a center island and walls of hanging space. The lower level features a screening room, bar with sink and refrigerator, full bathroom and tons of storage. A full access elevator and 3-car garage are just two of this home's amazing features. This home features one of the most magnificent backyards in all of the Main Line. 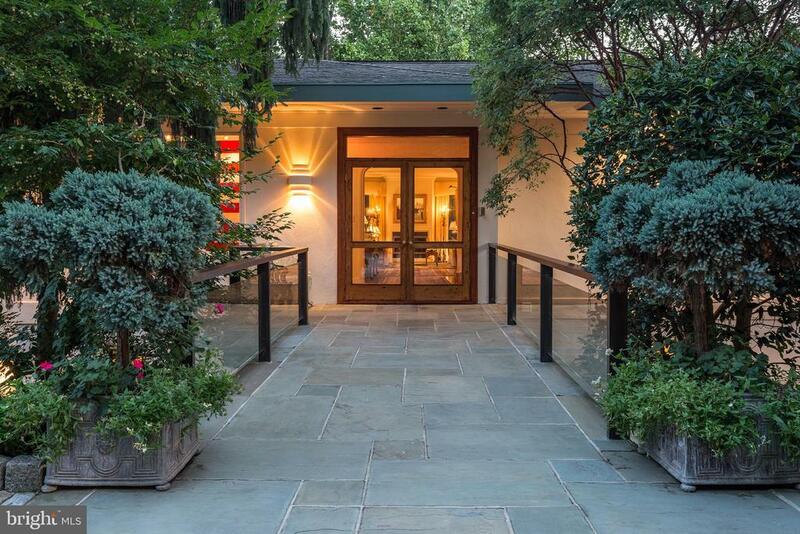 Easy access to 476, 76 and Center City all while in the award winning Lower Merion School District." "This one-of-a kind estate is situated in a secluded, private grove on 1.45 acres of mature land within easy walking distance of the historic village of Gladwyne. The Estate includes the Main House & Barn at 916 Black Rock Road. The Main Home is 13 years new, with 5 bedrooms, 4 full & 1 half bathrooms. Its first floor master is surrounded by 2 private gardens, & features his-and-hers walk-in closets plus a spa-like bathroom w/ a wall of windows & private access to a secret garden. Random-width wood floors run throughout the first floor, which includes a formal living room w/ fireplace, a large dining room surrounded by windows & doors that open onto a flagstone patio overlooking the property, and a large family room with stone fireplace & vistas that bring the outside in. Its doors lead to multi-level flagstone patios for entertaining in manicured gardens. The kitchen boasts a large island w/ seating, plus solid wood cabinets in beautiful rich wood tones topped with black soapstone counter tops. Antiqued white wood cabinets set apart the fully-equipped butler's pantry, abundant w/ storage, a second dishwasher, & a wine refrigerator. Lower level features a bespoke 1,000+ bottle wine cellar, large game room/entertainment area, personal gym, full bathroom w/ steam shower, & extra pantry & storage areas (including cedar closet). The Barn renovation preserved its history by salvaging & maintaining the original floors, ceiling beams, & barn doors, & enhanced the building to include: 2 bedrooms, 2 full bathrooms, full kitchen, a living room w/ fireplace, large dining area, flagstone patio, 2-car attached garage, laundry, & a large meeting/party room w/ a kitchen staging area. This is a once-in-a-lifetime opportunity to own an outstanding piece of the Main Line: Its history and future!" "Only once in a lifetime does a home of such beauty become available. 1309 Summer Hill Lane in Gladwyne is a one-year-old, stunning, stone, estate home situated on a coveted lot, on a cul-de-sac, in the exclusive Fenimore Community in sought-after Gladwyne. This 4 Bedroom, 4 full Bathroom, 3 half-bathroom estate was meticulously built by Pohlig Builders with a balanced combination of architecture, design and timeless finishes. Showcasing a rare uninterrupted view, the 6,465 square foot masterpiece captures sweeping views from all three floors. This fabulous residence has a grand center hall entrance with a wide stairway, an open floor plan with high 10 ft ceilings, recessed lighting and gorgeous hardwood floors throughout. Awash in natural light, the open, airy first floor includes a Dining Room with crown molding overlooking the beautifully manicured front lawn. The Living Room, which overlooks the backyard and beyond, has a gas-burning fireplace with stone surround and gorgeous reclaimed wood beams. The eat-in chef~s Kitchen is a dream with an over-sized center island, hi-end stainless steel appliances, double ovens, and an open eat-in Breakfast Room with doors leading to a tranquil deck. There is a large walk in Pantry and a wet bar with sink and wine refrigerator. The generous-sized Office has beautiful custom built-ins. A mud area, two Powder Rooms and direct access to a three-car garage completes the first floor. The luxurious Master Bedroom Suite offers a spectacular view, a stone, gas fireplace, soaring ceilings and floor to ceiling windows. The sumptuous Master Bathroom includes heated floors, double vanity, soaking tub, a luxurious glass enclosed shower, and water closet. Two custom walk-in closets complete this fabulous master suite. There are three additional spacious Bedrooms, all with private Bathrooms, a laundry room and over-sized landing that can be used as an office space, homework room or TV area on the second floor. 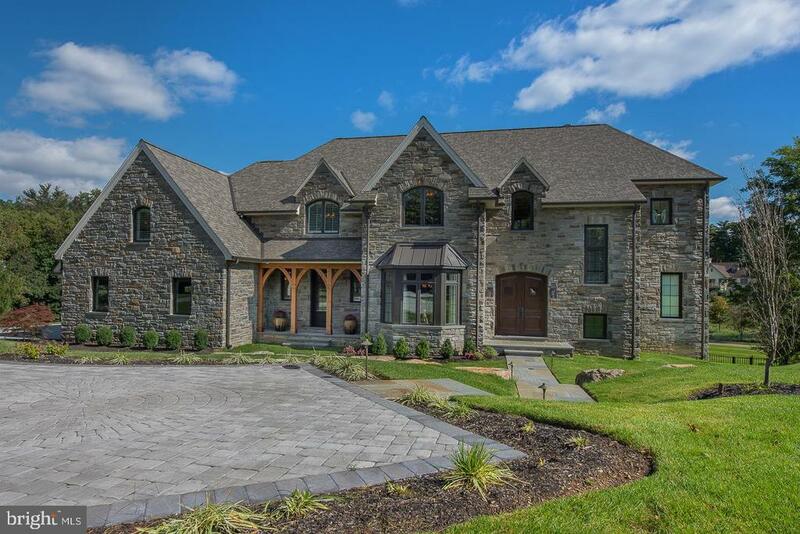 The finished, walk out lo"
"To be Built - Custom build this Exquisite French Chateau set on a most sought after quiet tree lined street in Gladwyne (Bloomberg ranked Gladwyne as the 6th most-affluent Zip code in the entire country). The flat 1.76 acres of ground is surrounded by mature trees and is the perfect setting to build your dream home. This French Chateau is designed by Award winning Visich Architects, to be constructed to exacting detail by Baron Custom Homes and can be custom built with all the luxurious details you desire. The lot can easily also accomodate a swimming pool and pool house. 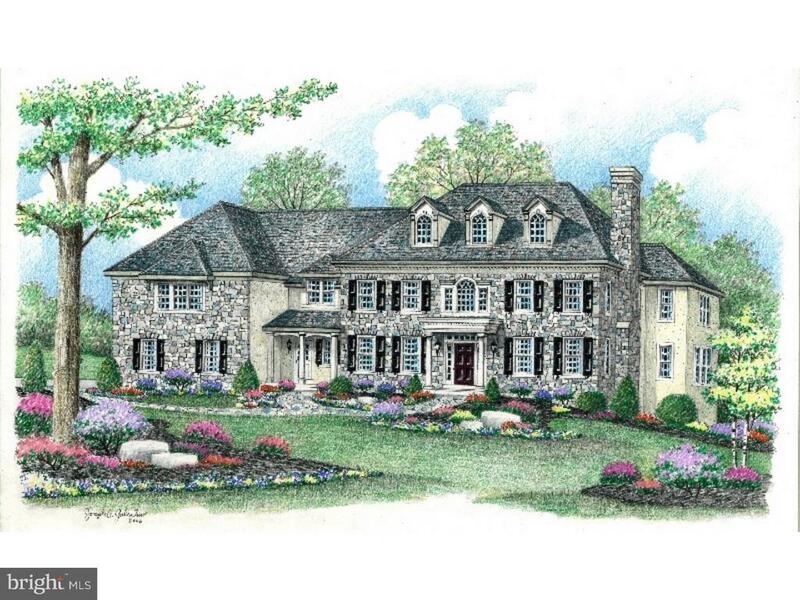 This proper main line estate will be delivered with a stone exterior accented with limestone and a slate style roof. The interior of the home will showcase a professional gourmet Kitchen w Island seating, dining room with butler's pantry, great room with an oversized fireplace, living room with fireplace and study, 5 bedrooms (with an optional 6th bedroom), 4 full bathrooms (with an optional 5th). Gorgeous custom cabinetry, marble, quartzite and the latest in home automation and smart technology. Enter into the home via a grand foyer. Ascend the main staircase to a Master Suite with a fireplace, sitting room, large walk-in closets and a Master Bathroom complete with a marble bath, multi spray shower and designer soaking tub. Attached 3 car garage (with an option for a 4th bay). Additional sqft. available in walk up third floor and lower level. Prime Main Line location close to Philadelphia Golf Club, easy access to highways and center city. Award-winning Lower Merion schools. Photos are of other homes built by Builder." 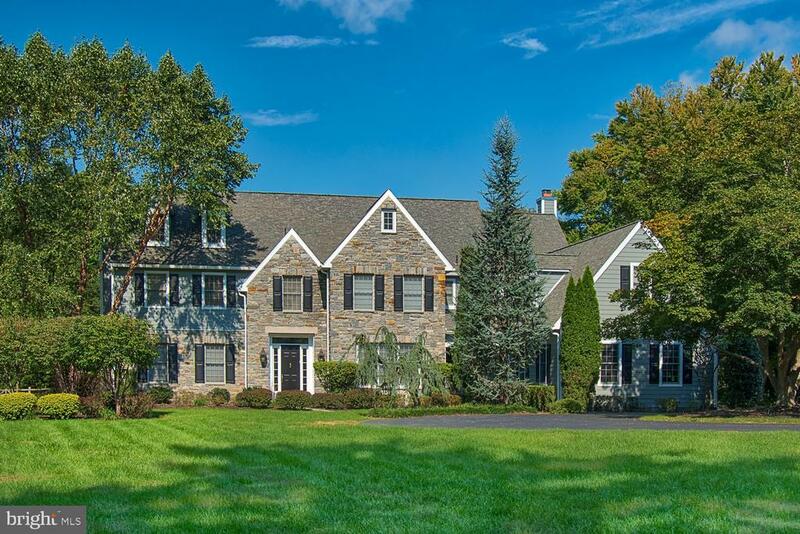 "Magnificent 1.74 acre parcel with views of Philadelphia Country Club in award winning Lower Merion School District. Gourmet Open Kitchen and Family Room make it the perfect home for entertaining. Or Choose your own Builder and Design your Dream Home. Lot offered Separately as Well (MLS # 7248339) Plans attached for stone and siding colonial with traditional floor plan designed by McIntyre Capron & Associates"
"A custom built prominent southern brick colonial estate home overlooking the broad expanse of the Philadelphia CC golf course. Set back from the road 2.32 acres. This home redefines curb appeal, beckons visitors from a long drive to a wide landscaped circle at the front door or turning right to the 3 car attached garage The elegant front entrance framed by 4 ionic white columns welcomes you to one of the most comfortable & practical homes in Gladwyne. A 25 yr. old, 8200 s.f. home with a 700 s.f. finished LL. 5 bedrooms, 4 full & 2 half baths, a total of 10 rooms on 2 stories w/ 5 fireplaces. Gas driven, fully air-conditioned, public water, double bed onsite septic. The 18' grand foyer features a parallel in period dual curved staircase leading to upper level landing. From the foyer there is a view of a FR to the left & a formal DR to the right A few steps ahead one enters through matching white columns a dramatic 2 story GR highlighted by heavy timbered roof beams, a beautiful fireplace, a full bar all bathed in the light from a full 2 story rear wall of glass providing views of a wide expanse of rear yard. A beautiful pool & plenty of room to add a tennis court. While still in the GR one can see a generous & smartly designed kitchen on the right, separate from & wisely near the DR. Beyond the kitchen the traditional back staircase leads to 4 bedrooms on the upper level. Beyond & adjacent to the back stairs one finds a mud & laundry room & full bath w/ shower convenient to pool traffic. 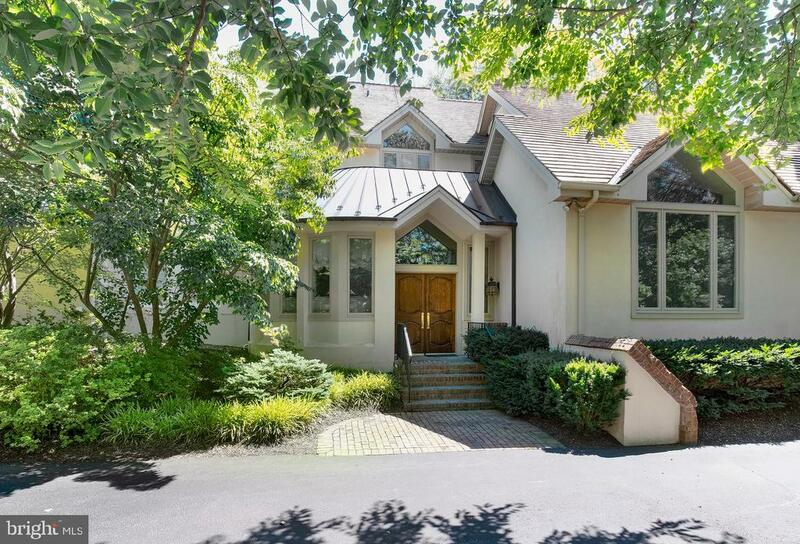 Left entering the GR you will pass a powder room on route to a bright sun room & a stunning formal study library appointed with rich & warm cherry paneling, a coffered ceiling w/ a host of built in shelves & storage space. The upper level equally well designed reveals a very large MBR w/ walk in closets & sitting room, generous bath w/ both a jacucci & a steam shower. On the other side of the upper level one finds 4 bedrooms, 2 w/ full ensuite bathrooms & 2 offerin"
"This stunning custom estate home situated at the end of a quiet cul-de-sac in the private and coveted Fenimore neighborhood of Gladwyne, offers over 8,000+ of sq ft and features 5 bedrooms with 5 ensuite full bathrooms and 3 powder rooms. This elegant estate features all the modern conveniences of everyday living with luxury finishes and great attention to detail throughout. This home stuns with soaring 10 ft ceilings throughout the first floor and 9 ft ceilings on the second floor, crown moldings, wainscoting, built-in shelves, and gleaming cherry hardwood floors. Several recent improvements and upgrades evident throughout. This home is exquisite right down to the finest details. The gourmet chef's kitchen features top of the line appliances, a modern open design and flows seamlessly to the family room with coffered ceiling and a beautiful fireplace, one of four in this amazing home! The breakfast room is the perfect place to enjoy a meal with lovely vaulted ceilings. The living room is spacious and open- the perfect venue for relaxation or entertaining! The stunning formal dining room features a wall of floor-to-ceiling windows, wainscoting, and beautiful light-fixtures. The formal sitting room stuns with custom built-ins, endless windows, and a fireplace. The French Doors in the family room gives access to the home office, which has an additional fireplace and provides the perfect place to work. Upstairs The gorgeous master suite features a vaulted ceiling, His & Her custom closets, and an otherworldly lavish marble bath suite. The 4 additional exceptionally oversized bedrooms all feature ensuite baths and are all equally exquisite and spacious. The incredible finished lower level features a fitness center, an indoor basketball/sports court, an arts and crafts room, and a full commercial sized second Kitchen and bar area. Exterior features include a newer in ground pool/spa area with estate fencing, invisible fence, extensive landscaping and a 3-car oversized at"
"Turn Key, Breathtaking Frank Lloyd Wright- Style Living within 4.6 acres of easily maintained, secure Harold Kimmelman bronze gated grounds with low taxes and minimal running costs due to high efficiency geothermal systems and masterful construction. Welcome to Fernside Cottage, an exquisite residence set on spectacular, serene setting featuring incredible sun filled architectural designs and superior, timeless materials throughout. 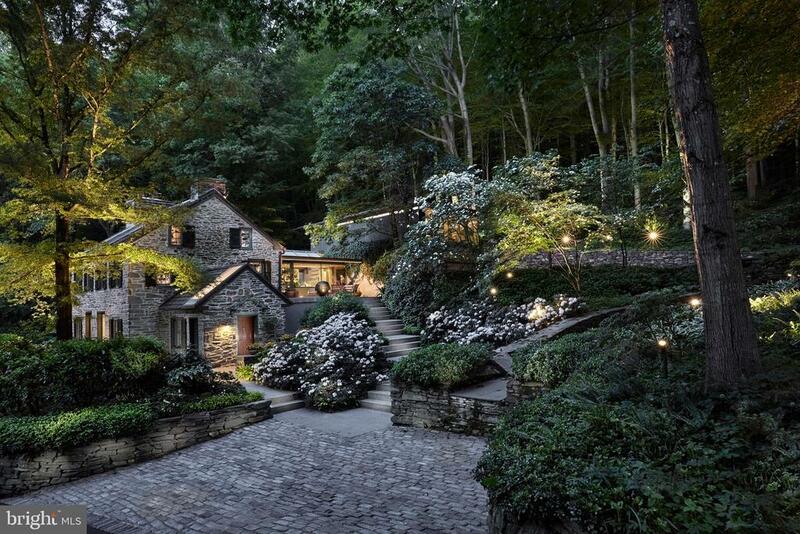 This masterpiece showcases a unique blending of original Pennsylvania stone structures with artistic contemporary steel and glass living spaces. The original portion of this spectacular property was built in 1835 as a mill worker's house, and remained so until 1910. The property was then bought by Dr. DeWitt Ludlum, a Psychologist who created the Gladwyne Colony. He converted the structure into a home for himself in 1910 and it remained his residence until 1964 when John Dorrance bought the property along with many additional properties to create the Dorrance Estate. Fernside Cottage remained part of his Dolebrand estate until 1992, when it was sold as part of his estate. It was purchased by the current owners in 1992 and went through major renovations between 1993 ? 1995, when a 3 car garage and spacious 2 bedroom guest cottage were added. The original renovation as well as the more recent additions carefully designed and constructed in 2007, incorporate exceptionally fine architectural features by renowned architect Daniel Evans White from Vancouver, British Colombia. These additions to the main residence are seamlessly blended with the original structure and expand the sophisticated style of the home, while incorporating endless exterior views and as much natural light as possible. Please note: Just 15 minutes from Acela trains to NYC and D.C., 15 minute from Center City Philadelphia. The Ultimate In Turn Key Living with 400 Amp Generator! *-**Seller to relist with KSIR, please contact Lisa Yakulis with any questions or serious "
"Great opportunity to purchase a custom designed home on one of the Main Line and Gladwyne's most spectacular properties. This stunning 20 year old French Colonial, with 5 bedrooms and 8.5 bathrooms(one bathroom is located in the pool house), is situated on almost 3 acres of park-like, professionally landscaped grounds, on one of Gladwyne's most coveted streets. Lovingly maintained and upgraded, this home offers a dramatic, spacious, open floor-plan with great flow for easy living and entertaining. Soaring ceilings and a multitude of windows, including two architectural palladium windows, allow light to permeate each room with spectacular views of the gorgeous outdoors. The first floor comprises a large center hall, living room with fireplace and French doors to a study/office with built-ins. The formal dining room leads to a butler's pantry, a large modern, granite kitchen with island, breakfast area and family/great room with cathedral ceiling and a huge palladium window. A first floor fifth bedroom and bathroom (both handicap accessible), mudroom and large walk-in coat/storage closet and powder room complete this main floor. French doors from the entry hall and sliders from the breakfast area lead to an expansive slate patio overlooking the breathtaking grounds, 45ft in-ground pool and hot tub with waterfall. A pool house with full bath, shower, changing room and multi-level storage is conveniently located nearby. The second floor offers a master suite with vaulted ceiling, his & her bathrooms and two large walk-in closets. There are 3 additional very large bedrooms, all with their own full baths and a spacious laundry room. An open staircase leads to the huge floored attic for additional storage. This large area can easily be converted to additional living space. The incredible lower level with 10 foot ceilings has a full bathroom and is divided into a huge art studio, an entertainment area with big screen TV, a game room with custom designed open space for game"
"Seize this rare opportunity to custom craft your own newly constructed Estate, majestically set on a premier, private 1.6 acre lot in coveted Gladwyne. This exquisitely crafted exterior, designed by renowned Archer Buchanan Architects and constructed by master builder Ken Cassella, was inspired by the grand English country homes of Sir Edwin Lutyens in the 1920's, using only the finest, timeless materials including 8 stone, 4 cement plank siding, grey slate roof, copper gutters and downspouts and large Pella Architectural Series windows. Breathtaking interior features and framed spaces are ready to finish by Ken Cassella at the list price (customizable specs are available) or by the builder of your choice after purchasing as-is.The already framed graciously large rooms and open floorplan include 10-foot ceilings on the First Floor, 9.5-foot ceilings on the second floor, a grand open foyer with 4 solid mahogany door, spacious Living Room and Library with fireplaces, generous Dining Room, Butler's Pantry, expansive Gourmet Kitchen layout with adjacent sun-filled Breakfast Room and Family Rooms, each with glorious views of the private grounds, future terraces and pool if desired, Home Office, elevator shaft with access to all 4 levels and a Second Floor In-Law Suite, and Mudroom leading to the oversized 3 car garage and rear staircase. The magnificent Main Staircase in the rear of the Entrance Foyer leads you up to the Second Floor, offering 6 large en-suite bedrooms, each with their own full Bathroom and walk- in closet. The existing Master Bedroom framing defines a Sitting Room, Bedroom, sizable walk-in His and Hers closets, and stunning Master Bathroom space to accommodate every feature and amenity. The Third Floor and full Lower Level offer over 5000 square feet of flexible multi-purpose space to accommodate your future Gym, Media Room, Indoor Golf Range, Wine Room and more! Don't miss your chance to create your dream residence with a premier Main Line builder on "
"TIMELESS SOPHISTICATED ELEGANCE is beautifully executed throughout this incredible gated Estate with new roof and septic system. The light-filled designs with large windows, French doors accessing stunning Outdoor destinations, 10' ceilings and an open floor plan concept, were seamlessly envisioned by renowned Architect Peter Batchelor, ahead of its time. Unparalleled construction is evident showcasing exquisite, understated materials and finishes. This masterpiece, with sweeping private views from every window, is a rare, move in ready package, seldom offered along the Main Line. It features easy Main Level Living/ Entertaining spaces, a full Sized Elevator,3 additional spacious Guest/ Secondary Bedroom Suites, each with their own marble bathroom and outdoor patio access, Gym with Sauna, separate Guest House/ Office with Full Bathroom in close proximity to the house, artistically crafted natural cherry, true Gourmet Chef's Kitchen with separate Sub-Zero refrigerator/ freezers, 6- burner Thermador gas cooktop with center grill, 3 Thermador wall ovens, 2 Bosch dishwashers, 2 warming drawers, large center eat-in island with separate prep sink, spacious pantry, expansive custom crafted Butler's pantry with wine cooler and Asko dishwasher, Gracious Dining Room, bright Breakfast Room with fireplace leading out to an incredible outdoor seating area, comfortable Family Room with high ceilings, crown moldings and Media Built -ins off of the Kitchen/ Breakfast Room, multi purpose Media/ Game Room and 4 season sun room with Open access to the breathtaking pool, spa, cabana with changing room, bathroom and kitchenette plus entertaining terraces. Pull through the gates and enjoy your serene retreat close to Center City Philadelphia, the Airport, Acela trains, NYC, renowned schools and more." "This gorgeous home sits majestically on top of a hill offering a delightful sense of privacy and beautiful long views from the one-acre property. Recently and exquisitely renovated (2009-2014) with the finest materials and appliances, this magnificent house exhibits a perfect balance of spaciousness and intimacy. The home is always welcoming with its naturally bright interiors and open spaces. The gourmet kitchen, with 48 Viking range with double doors, wall oven with warming drawer, wine cooler, double dishwasher, two sinks, together with a full bar in the basement, outdoor slate patio and temperature-controlled wine cellar make this the ideal house for hosting dinner parties and family gatherings. The theater/game room and swimming pool further provide endless family fun and entertainment. At the same time, the master bedroom's private balcony offers extraordinary views for miles, and the upstairs library is an ideal spot for peaceful study or relaxation. This special property offers endless possibilities with a first floor bedroom/guest/master and an additional home office. The house also features a workout area and an elevator with access to all floors. Mere minutes from the center of Gladwyne with all of its amenities, this location makes for a very easy commute into downtown Philadelphia or out to King of Prussia and Valley Forge. Virtual Tour: https://www.realtymainline.com/1236-lafayette-road/"
"EXQUISITE NEW CONSTRUCTION IN THE HEART OF GLADWYNE!!! Another Stunning home from Cunningham Construction!! Situated on a quiet and coveted cul-de-sac, within walking distance to the Gladwyne Village and Bridle Wild Trails. Natural light permeates every room of this gracious, 5,300(approximate) square foot,5 bedroom, 5 1/2 bath stone colonial. First floor office/optional 6th bedroom with full bath. Large, dramatic living area with open floor plan ideal for entertaining. Gourmet kitchen with oversized quartz island, open-plan breakfast area with skylights and large family room overlooking the back yard. Extraordinary Master suite with vaulted ceiling, enormous his and her walk-in closets and luxury bathroom. Beautiful architectural details and tasteful, high-end fixtures and finishes throughout. Other features include white oak floors, Mica stone and Hardie siding facade, high efficiency 2-Zoned heat and central air, finished lower level with full bath, 2 car attached garage, second floor laundry, 2 fireplaces. Public Sewer. 200 amp underground service. Square footage is approximate and includes finished lower level. This special home is a must see!!" "Stunning 8200 square foot custom Mediterranean contemporary home positioned on 2 + private acres across from the 8th Hole of Philadelphia Country Club offers unparalled living with 5 bedrooms and 6 full baths in the main house and 1 bedroom with full bath in the adjacent cottage.Enter the grand Foyer highlighted by inset granite floors. To the Right of Foyer find the Formal LR enhanced w/ dramatic, vaulted ceilings, 2 exposures of light and corner set gas log fireplace. A few steps up find an elegant Music Room, centrally located for entertaining or in home practice, this space connects to both the kitchen and living area, and provides exceptional flow. The expansive Formal Dining Room with enclosed wet bar also comes equipped with a wood burning fireplace and generous custom built-in cabinets. Its southerly wall is a long gallery with views of the private yard and access to the handsome wood-paneled Library complete with custom bookshelves, a screening area, and a working office space. The 2-story Family Room is flooded with light and provides a gas fireplace, custom window seats and shelving. The SpectacularBulthaup chef's kitchen is complete with black granite counter-tops and Bulthaups classic honey toned cabinets with brushed stainless accents. Expertly appointed, with 2 large under-counter sinks, built-in ice maker, 600 series Sub-Zero refrigeration, Viking stove with gas burners, griddle & grill as well as 2 Gaggenau wall ovens & built-in Miele coffee center. Off this main kitchen is a large outfitted Caterer's Kitchen offering an additional full sized Sub Zero refrigerator, adjacent large Laundry, and Powder Room. Access a convenient Mudroom/Family Entrance & beyond lies the attached 2 car garage detailed with oversized cabinetry & epoxy finished floors. Ascend a custom open stair to the Master Retreat highlighted with His & Her bathrooms and generous, separate closets and custom storage. 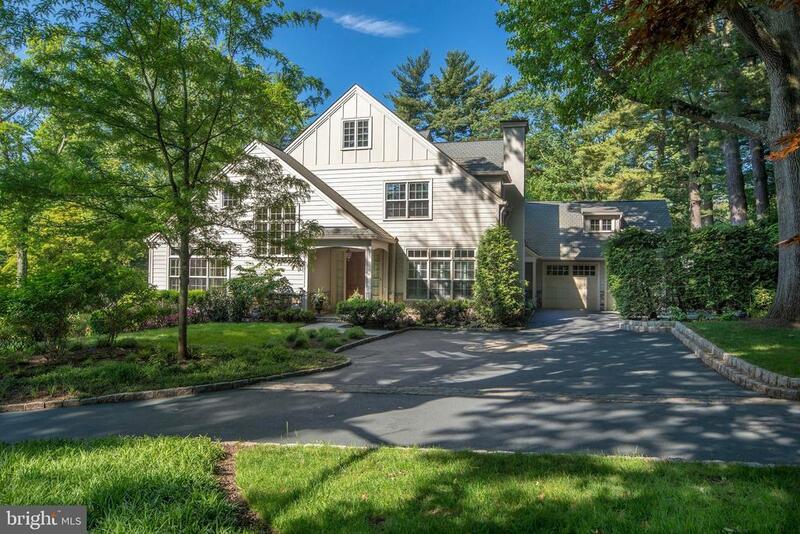 Master connects to a bright open gym & to a Southern facing outdoor de"
"Welcome to 1124 Youngsford Road in Gladwyne. This spectacular 5 bedroom, 4 full bath, 3 powder room, over 6,000 square foot luxurious masterpiece is located in the heart of Gladwyne. This marvelous estate features custom millwork and architectural features throughout with meticulous attention to detail. This fabulous residence has a grand center hall entrance with a wide stairway, a spectacular open floor plan with spacious light-filled rooms, high ceilings, and gorgeous hardwood floors throughout. The first floor features an oversized gourmet kitchen with large center island that can seat up to 4 bar stools, granite countertops, stainless steel appliances, 6-burner Wolf stove, custom cabinetry, beautiful tile backsplash, large pantry, and an oversized sunny breakfast room. The grand family room has high ceilings, gas fireplace, and beautiful windows overlooking the backyard. The generous-sized, sunny dining room complete with wainscoting, crown molding, tons of light and a butlers pantry that includes a sink, wine fridge and ice maker. The large living room has a beautiful fireplace, floor to ceiling windows, overlooks the lush side yard and has French doors leading to the office /den with tons of light and a sliding glass door to a private patio. A large walk in coat closet, oversized mudroom, 2 powder rooms and access to the 3-car garage completes the first floor. The second floor boasts a luxurious master bedroom suite with separate sitting room, large walk in closet and a lavish en suite with his and her vanities, soaking tub, glass enclosed shower and water closet. 4 spacious bedrooms, 2 with en suite bathrooms, a large hall bathroom with double vanity and an oversized laundry room with sink complete the second floor. The third floor features a bonus room that can be used as a playroom or second family room. The incredible lover level features a recreation room with built in granite wet bar, exercise room, half bath and a separate room that can be used as a be"
"Breathtaking Gladwyne Estate home set on a quiet cul-de sac in coveted neighborhood with pool, terraces, private views and outdoor entertaining area. Stunning features and amenities include Soaring ceiling heights with bright windows, fabulous millwork and moldings and a gracious open flow. Grand 2 story entrance foyer, Santos Mahogany floors, Gourmet Eat-in Kitchen with custom cabinetry, 2 dishwashers, gas cooktop, large pantry and spacious breakfast room, adjacent family room with new carpeting, vaulted ceiling with dramatic fireplace, private library with built-ins, sun room, luxurious Master Suite with sitting room and sumptuous marble bath, 4 additional bedroom suites on the second floor, expansive Walk-Out Lower entertaining level with 6th bedroom suite perfect for an Au Pair or In-law and more. Absolute move in condition with new roof in 2010. Close to renowned schools, transportation, center City Philadelphia, clubs, restaurants and more." "Welcome to this lovely classic colonial nestled on a private one acre professionally landscaped lot. This gracious home is located on one of the most sought after streets in Gladwyne, This home has outstanding formal room, a gourmet kitchen with all the bells and whistles, an inviting sunroom with views of the large patio which features an inviting heated in-ground spa with ample room for family fun. The sophisticated master suite is an oasis of comfort and a highlight of this lovely home. Easy access to all major roads, Philadelphia and all its amenities, restaurants and shopping as well as award winning public and private schools. Enjoy Main Line Living at its Best!"